Often hailed as a true Mezzo Soprano, Holly Sorensen is known for her rich, colorful, and expressive timbre. A gifted singing actor with great versatility, Ms. Sorensen was described as having, “a grand time!....dispensing attitude with relish and producing some impressively chilling tones” – Opera News. Most recently, The Tampa Bay Daily Loaf wrote," a creamy mezzo that soars lusciously and is breathtaking in her cruelty", following her debut as Dalila in Samson et Dalila with St. Ptersburg Opera. 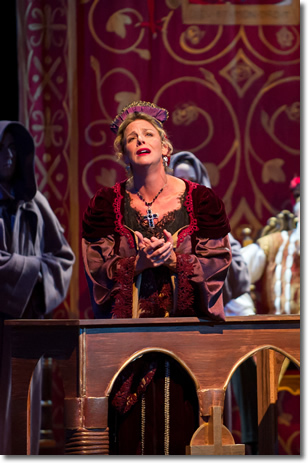 Ms. Sorensen performs a wide variety of repertoire, ranging from dramatic leading mezzo roles, to comic Rossini. Some of her other stage credits include, the title role in Carmen, The Mother - Hansel and Gretel, Suzuki - Madame Butterfly, La Prima Donna - Salieri’s Prima la Musica poi le Parole, Pitti Sing - The Mikado, The Secretary - The Consul, Sorceress - Dido and Aeneas , Prince Orlofsky – Die Fledermaus, The Princess Aunt – Suor Angelica, and Giovanna - Rigoletto . Highlights from various scenes programs include Isabella - L’Italiana in Algeri, Augusta - Ballad of Baby Doe, Charlotte - Werther, Mallika - Lakme, Mrs. Lovett - Sweeney Todd, and Mrs.Grose - Turn of the Screw. Some of her operatic Performance venues include, Utah Opera, Des Moines Metro Opera, Bronx Opera, Utah Lyric Opera, Connecticut Grand Opera, Opera in the Ozarks, Ardamore Chamber Opera, Opera Company of Brooklyn, Dicapo Opera, Boston Classical Orchestra, and The Greenwich Pops Symphony. Ms. Sorensen has also been lauded for her concert and oratorio work, as a mezzo with “luscious tones” – Greenwich Times and “glamorous and beautiful to see and hear” – Greenwich Citizen. She most recently made her Avery Fisher Hall debut singing as mezzo soloist in Mozart Requiem with DCINY; where she was hailed as, "radiant" by the New York Concert Review. She has also performed Mendelssohn’s Paulus with the Oratorio Society of New York in Carnegie Hall. Other performances include, Handel’s Messiah, Respighi’s Laud to the Nativity, Mendelssohn’s Elijah, the Yizkor Requiem and Bach’s St. John Passion. Ms. Sorensen performed the Mozart Requiem and Vivaldi Gloria in Venice, Italy with Dicapo Opera Summer Tour. This year she was the featured mezzo soloist with the Salt Lake Choral Artists in performances including the Bach B Minor Mass, and "The Armed Man", by Karl Jenkins. She has performed frequently with the Greenwich Choral Society and Greenwich Symphony in Connecticut. Other oratorio engagements include solo work with the Allentown Symphony, Norwalk Symphony, and First Congregational Church of Greenwich Orchestra. She has also been applauded for her recent recital repertoire including works by Mahler, Manuel de Falle, Schubert, Schumann, Barber, and spirituals by HT Burleigh. Ms. Sorensen was the featured mezzo soloist with Connecticut Grand Opera’s “Champagne and Arias” Gala. Ms. Sorensen was the winner of the 2011 Nico Castel International Mastersinger Competition at Carnegie Hall. She was a finalist in the Oratorio Society of New York Competition, and winner of the Mendelssohn Competition with Norwalk Symphony. Additionally, she was awarded Second Prize at the Eugene Opera Belle Voci National Competition, Second Prize at the Classical Singer Convention in New York, and was a semi-finalist in the National Association of Teachers of Singing Competition.